MyWirelessTV 2 replaces messy HDMI cables with the convenience of wireless, so you can install an HDTV anywhere you want. This easy-to-use kit wirelessly connects HDTVs to most HDMI cable/satellite set top boxes, Blu-ray players, and consoles up to 100 feet away, even working through walls and floors. 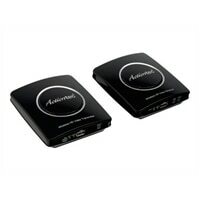 And Actiontec's state-of-the-art technology delivers a spectacular high-definition experience. All the highest HD videos standards are supported (1080p60 and super low latency technology), so you can cut the HDMI cords without having to worry about picture and sound quality. MyWirelessTV 2 gives you HDTV without the wires. Now it's possible to connect your television to your set top box without having to use an obtrusive cable. You get the flexibility to network your home exactly how you want to, without investing in an expensive wiring project, or string wires throughout your hallways. You can hang a flat panel in the bedroom without having to use an ugly HDMI cable. Connect another HDTV in the kid's room without needing another set top box or cable hook-up. You can even move a big screen TV out to the patio for a party. MyWirelessTV 2 works with most HDMI-compatible source devices, including cable or satellite set top boxes, DVRs, Blu-ray players, gaming consoles, desktop and laptop computers. You can stream live TV, as well as protected content such as Blu-ray and DRM. MyWirelessTV2 only works in one-to-one environments, there is no option to add additional receivers at this time.